The MRDS support for Robotino is here! Follow the instructions below for information on using the package. Please note that the Robotino MRDS package only works with the API2 installed on Robotino. Please note that the Robotino MRDS package only works with the API2 installed on Robotino. Microsoft Robotics Developer Studio 4. MRDS requires .NET 4.0 but does not install it because this comes with Visual Studio. Please note that the RobotinoMRDS package has been tested with MRDS 4. It is therefore recommended to use MRDS 4. Extract the contents of the ZIP package to Microsoft Robotics Dev Studio 4\packages directory. After extraction, your directory structure should look like Microsoft Robotics Dev Studio 4\packages\RobotinoMRDS. If the above mentioned steps were followed properly, then the build should complete without any errors. With the IP address your Robotino. Note: After you make the changes, make sure you build the project once again to reflect the changes in the dll which is used by other projects within RobotinoMRDS. More services shall be supported in the future. A couple of examples have been provided for a better understanding of the Robotino Services and they are located in the RobotinoMRDS\Examples directory. A simulation scenario example has been provided for a better understanding of the Simulated Robotino Services and it is located in the RobotinoMRDS\Simulation\Scenarios\WallFollow directory. The bleeding edge RobotinoMRDS sources use the environment variables ROBOTINOAPI2_32_DIR and ROBOTINOAPI2WRAPPER32_DIR to locate the required DLLs. These DLLs are built by the RobotinoAPI2 and RobotinoAPI2 Wrapper projects. Read below for more information. 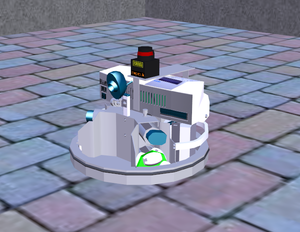 Please follow the information on this wiki page to build the RobotinoAPI2 from the sources. Please do not forget to set the ROBOTINOAPI2_32_DIR environment variable. Please follow the information on this wiki page to build the RobotinoAPI2 Wrapper from the sources. Please do not forget to set the ROBOTINOAPI2WRAPPER32_DIR environment variable. This page was last edited on 21 March 2012, at 16:19.